Are you going on holiday to Bangkok? If you intend on visiting some of Bangkok’s famous Buddhist Temples read our tips below. 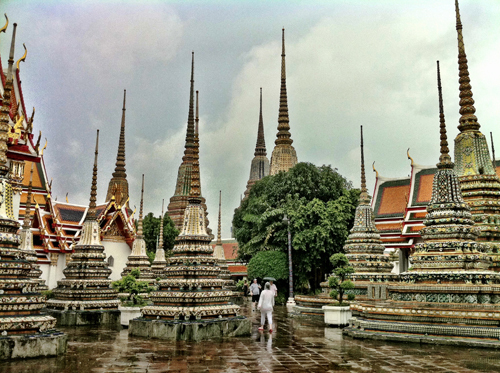 As the capital city of a country with more than 50 million Buddhists, Bangkok has its fair share of Buddhist temples. Buddhist temples in Bangkok vary greatly in size from the majestic royal temple to more humble local neighborhood temples. If you do decide to visit a temple in Bangkok early morning is probably the best and most interesting time to go. Temples are less crowded with visitors in the mornings while the monks can be seen doing their daily morning activities including chants or walking round the neighborhood with begging bowls to collect alms from the local faithful. Giving food and other daily supplies is considered an act of merit making for Buddhists who in turn will expect to receive good Karma either in this life or the hereafter. Once in Bangkok you’ll notice shops selling orange buckets which are full of daily necessities like food, soap and toothpaste which can be bought and offered to monks. Foreigners are entirely welcome to participate in Buddhist rituals like merit making and giving offerings. The basic action that should accompany giving an offering to a monk while at a temple in Bangkok is to bow your head to the floor three times while holding the palms of your hands together. This temple is almost entirely constructed from white marble which is where it gets its name from. The temple was designed by a member of the royal family in the early 20th century making it the most modern of the royal temples in Bangkok. Inside the temple are many different images of Buddha on display in various regional styles. This temple is located on Si Ayuthaya road, admission costs 20 Baht and the temple doors are open from 8am to 5pm. Wat Po is probably the most famous temple in Bangkok partly because it’s the largest. Constructed in the 16th century Wat Po is also the oldest temple in Bangkok. One of the main features of this temple is the 40 metre statue of a reclining Buddha which was made in the 19th century. Wat Po is always busy with foreign tourists and Thai people alike, partly because it is also home to the most well known Thai massage school in Thailand. English speaking tour guides can be hired for a 200Baht.